The Library Publishing Coalition and the Educopia Institute are excited to host a series of virtual pilot workshops based on the IMLS-funded Developing a Curriculum to Advance Library-Based Publishing project. 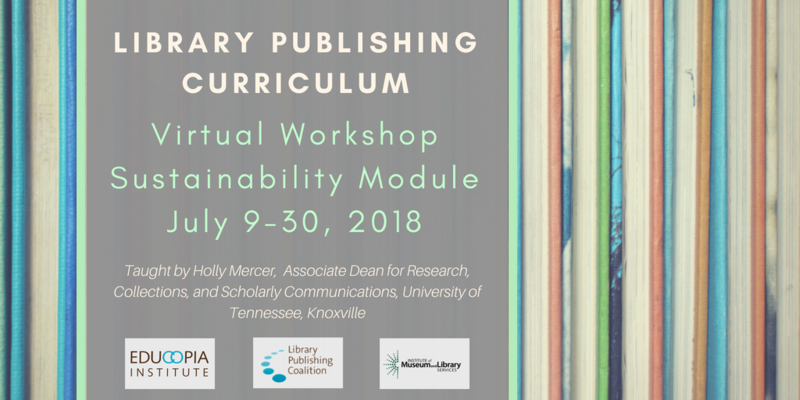 Our first virtual workshop - Library Publishing Curriculum: Sustainability - will begin on July 9, 2018 and will last four weeks, ending on July 30. The workshop is limited to 30 participants, and registration is first come, first served. There is no registration fee. This workshop is based on the Sustainability module of the Library Publishing Curriculum released in May of 2018. (Learn more about the release!) The Sustainability Module focuses on how library publishing endeavors can establish longevity and find long-term success. Attendees will learn how to build support with key stakeholders and communities, both internally (library staff) and externally (e.g., University Press), and how to undertake digital preservation to prolong the lifespan of digital publications. The workshop will be held over Zoom video conferencing software. Please note that by registering to attend this virtual workshop, you are agreeing to attend all four sessions and to complete all assigned readings and coursework (estimated 1-3 hours per week). All sessions will be held from 12:00-1:30 pm ET via Zoom video conferencing software. Connection instructions will be sent to participants ahead of time. If you are interested in participating in the workshop, please register in Eventbrite. The deadline to register is July 2, 2018. Registered participants will be sent connection instructions and other information about the workshop by Friday, July 6.